If you are thinking of holding a personal event we have the print solutions for you. Our digtal process can provide low quantities of many items to suit your needs. 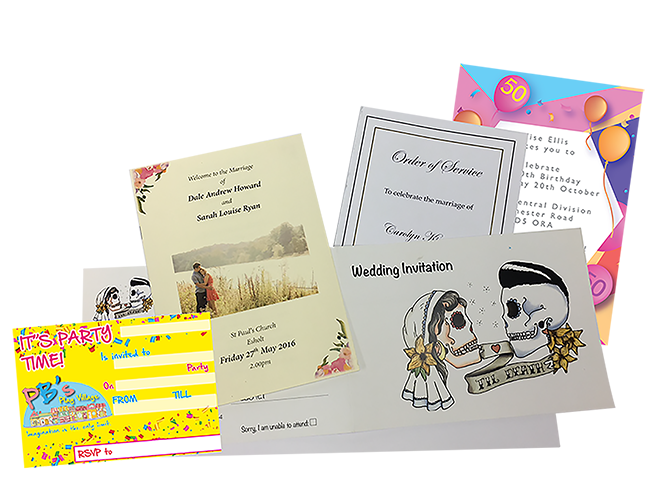 Using the latest digital technology, we can produce wedding invitations, save the date cards and anything else you may need to make your day special. We can design and produce bespoke party invitations to make your party be remembered. We can produce Order of Service booklets at short notice. We can do all the artwork and layout from the information you supply. call 01274 660686 to request a brochure and see the quality of our work for yourself.